This is a very interesting strategy game by Altar Interactive, which, thanks to a skillful combination of RTS and cRPG game elements, definitely stands out from competitive productions. * and one hell of a game! American scientists working for Department of Defense find out that this mineral is in fact identical to the substance used to power an extraterrestrial artefact in their possession. This object is called the EON (Extraterrestrial Object Nexus). DoD Experiments have shown that items placed in the capsule are transported hundreds of thousands of years back in time. The American scientists were not able to understand its construction, nor could they manage to synthesise its fuel. Eventually, the machine - classified Top Secret - was stored, pending further advances in human science. The experiments carried out with the new mineral, called siberite, discovered that in addition to its being the fuel for the EON, that it catalysed cold fusion. As the Russian Federation itself was in a state of turmoil (which the original expedition was there trying to ease in the first place), there could be no guarantee that the leaders in Moscow would not use siberite to enslave other European nations, as well as their own scattered state once again. The Americans therefore decided to act quickly. Using the EON, they began to send special units into the past to mine all of the siberite and transport it to the nearest territory under their control - to Alaska. However, the Russians learn about this plan, and they are not the only ones who don't like it. Neither the brave and sympathetic John Macmillan, nor the proud and patriotic Yuri Ivanovich Burlak Gorky know what they are about to face on this adventure. Shall they follow their orders to the bitter end, or shall they try to find an escape from the vicious circle of destruction? One thing however remains certain: they are going to change the history of mankind. How? Well, that depends on you. The whole story is in section BONUS/VIDEO. All of the missions within the game are bound together by single storyline. This is not just a fancy backdrop for the missions; it is completely integrated and influences the progress and objectives of all of the missions. You will constantly be making decisions that influence the course of the game. You might, for example, help an enemy in one mission and receive unsolicited and unexpected help several missions later, or you can kill somebody and later meet his avenger - there are many branches to the storyline and we believe that discovering them will be one of the most exciting things about playing Original War. And it is up to you how to decide how the story is ultimately going to end. 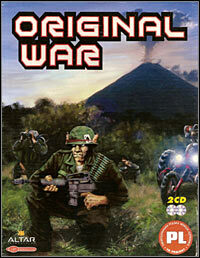 Even though Original War uses an isometric PoV and pre-rendered sprites, it is NOT a 2D game. The terrain is completely 3D and this has important implication for gameplay - units on higher ground have longer ranges of sight and fire, units going uphill are slower than units going downhill, etc. Obviously, you cannot rotate or zoom in the camera with pre-rendered graphics, but this is not a feature that we miss. It would be possible for us to implement rotation, but we decided not to do so, as we believe that this only confuses most players. It is very important to realize the distinction between 3D and 2D engines and 3D and 2D games. In 2D games with levels (e.g. Age of Empires) your units can never go uphill, and the steep slopes are, in reality, just a type of no-entry terrain. In a 3D game, every unit, building, vehicle, or tree has a third co-ordinate, the height of the terrain they rest on. The question whether pre-rendered sprites or real-time rendered 3D models represent the game world is irrelevant in this context - quite a few of the so called '3D RTS' games are, in reality, simple 2D games. Since we have a true 3D engine, we are also using a z-buffer. This means that we are able to display correctly any complex 3D scene - our vehicles and buildings do not seem to pass through each other, and when a vehicle drives into a factory, you can see it through the window. You can see the legs of people wading through the water, and each object casts a realistic shadow, etc. In short, you get the same impression you would get from any 3D engine, but with crisper and more detailed pre-rendered graphics. In our game, people are your most precious resource. Each of them has a unique personality, with his own name, face, quirks, and several skills that can be improved over the course of the game. You take your experienced men and women from mission to mission. Every character also has a profession - this determines what he can do within game. For example, engineers can erect building, soldiers can fight, mechanics build vehicles, etc. The profession is not a fixed attribute of a character, though, and can be easily changed during the course of a mission. But not everyone will make a good mechanic - this is where skills come into play. Some characters are gifted in one area, some in others, and the player must carefully balance his needs and his character's possibilities. The most interesting element of the game are the people. There is no way to produce them in Original War. From time to time you may discover another soldier transported to the past by the EON and that's it: no barracks to produce grunts, no training camp to churn out soldiers out of nothing. Moreover, people are necessary to make things work: they have to drive the vehicles, operate the factories, carry out the research, etc. Another interesting element is closely related to how the EON works: when transporting objects to the past, it scatters them both in time and in space. Therefore there is no telling when and where a new shipment or new man is going to appear. Due to the small size of EON, only parts of equipment and machinery are sent, in plain wooden crates. The terrain plays an important role: water or marshy areas slow units down, hills and knolls increase the range of sight and fire, the trees and other obstacles can hide units, the grass gets trampled by moving units, and you can use the marks in the grass to track the enemy's units. Wheeled vehicles cannot climb steep slopes, but on the other hand, tracked vehicles are much slower overall. And the environments are alive as well: you will have to fend off hungry sabre-tooth tigers, aggressive Apemen, and you can even be attacked by an Arabian sheik riding a huge mastodon!. Every mission is different, with varied and interesting objectives. Beside the old and tired objectives Survive, Eliminate all hostile units in the area, or Protect your base, you can also try the following: Tame an Apeman, Capture the commander of the Alliance, Try to save your brother (but don't neglect your other duties), Take the Artefact North, build a time-space laboratory, and use the Artefact to determine the bearing of the Motherlode. And the list could go on and on. As we already said, you will be making constant decisions that can influence the course of the game. Almost any mission also has secondary objectives. These may bring you some extra bonuses, and moreover you will be awarded medals for completing them. There are three difficulty settings: the first is for the players who are more interested in the story of the game, the third is for the players who like a real strategic challenge, and second one is somewhere in the middle. If you really do trust your skills, you can try playing the missions on the highest difficulty setting without saving - the game rewards you with additional points for this. Original War also contains exhaustive on-line documentation and a smart interactive hint system. Sound F/X feature the usual mix of explosions, fire, the rattle of guns, etc. Every weapon has a specific sound, and the same with every vehicle and building. You will also hear the rush of waterfalls, the trickling of streams, song of birds etc. But the musical score is something extra - it was composed by the well-known rock musician and movie score composer Michal Pavlicek (e.g. score for Scarlet Pimpernel). Each side had a typical sound (a guitar for the Americans, an accordion for the Russians). The music adapts interactively to the action on the screen. Each side has its particular way of communicating the storyline. The Americans have the elegant on-screen sketch-book/diary of John Macmillan, and the Russians have a computer terminal with a slow connection (so slow, in fact, that they have to use the ASCII graphics for the display). Without doubt & discussion. Try it and see for yourself! Original War supports both LAN and Internet multiplayer, with maximum of 8 sides and 12 players (we'll discuss the distinction later). As the game's host you can choose from dozens of multiplayer maps, each of which supports more than one type of game: from the obvious Free for all and 2 vs. 2, to more sophisticated game modes like Capture the flag, to downright wacky modes like Original Football (drive any vehicle through your opponent's goal posts) or Stonehenge (two teams of scientists trapped in the space-time continuum fight for a common pool of resources without actually seeing each other). Multiplayer also supports the very interesting (and still quite rare) option of shared control, i.e. several players playing not as allies, but as a part of single team: for example, one player can take care of gathering resources while the other guides their units in combat - the units that are being controlled by your alter ego are denoted by bright yellow triangles. For some missions this type of control is strongly recommended and from our experience we can say that this is extremely satisfying way of playing multiplayer. Another remarkable feature of Original War's multiplayer are morale flags on certain maps. These happen to be in the players' bases and they increase the Defence of the home team. So much for an initial onrush, then - you have to develop your small army a little before you can take on your enemies. In a typical multiplayer mission you will see initial skirmishes for crates and position, then small reconnaissance by force with light fast vehicles (being in combat increases skills of your men, so playing hide-and-seek with the enemy turrets is a good way of gaining exp) and finally great battles, where everything is at stake: a premature attack is just as bad and ineffective as the late one. Game score 8.8 / 10 calculated out of 3649 players' votes.